Fred Ross is the father of Fred Ross, Jr. 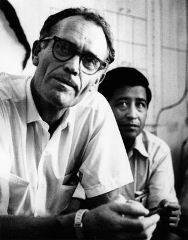 In 1947, Saul Alinsky hired Fred Ross, an experienced organizer among California's migrant farmworkers. Ross built the Community Service Organization in several cities, mostly among Latinos, recruiting new members and identifying potential leaders through house meetings and one-on-one conversations. In San Jose, California, one of the people Ross recruited was Cesar Chavez, whom Ross hired and trained as an organizer. Chávez would later adopt these organizing ideas in starting the United Farm Workers union. Well its 2 days or so with no comment to speak of about this photo of a Community Services Organization leadership group at a mid 50's conference. Far left Saul Alinsky, mid front Ed Roybal to his left organizer Fred Ross to his left Herman Gallegos, below second from left ins suit a portly Cesar Chavez. The 1948 presidential election was a turning point in American politics. The convulsions within the Los Angeles Democratic Party including the movement of some labor, left, and minority coalition members into the Independent Progressive Party, led by President Roosevelt?s second vice president, the Spanish-speaking Henry A. Wallace coincided with the most dramatic grassroots movement in the history of the city: the Mexican-American-oriented Community Services Organization. CSO, under the leadership of president Ed Roybal and organizer Fred Ross, and with the financial backing of independent radical Saul Alinsky, recruited 1,000 members and registered 15,000 new voters in the Latino sections of Boyle Heights, Belvedere, and East Los Angeles. Sensing an electoral opportunity, the Progressive Party recruited and ran two CSO members for office and brought Wallace to the nearby Lincoln Heights Stadium where he addressed 10,000 Latinos in Spanish. The district, particularly the Boyle Heights section, was a cauldron of leftist political activity, residents radicalized by events in their home countries (including the Russian Revolution and the Mexican Revolution) and by the upsurge in political and labor activism during the Great Depression. This included various shades of New Deal liberals as well as Communists, Socialists, Trotskyists, Wobblies, and radicals too independent to follow any party line. The incumbent city councilman, Parley P. Christensen, was like most Angelinos of the day: born somewhere else. An Idaho native educated in New York, he had served as a Unitarian in the Utah State Legislature. He became a national figure on the left in 1920 as the presidential candidate of the Farmer-Labor Party (which was particularly strong in the Midwest and in the 1930s elected the governor in Minnesota). In Los Angeles, Christensen successfully used ideology and support from organized labor to cut across ethnic and racial lines to maintain a progressive coalition. There was increasing frustration with Christensen among members of his political base, however, because Christensen had missed a significant number of city council votes. The Los Angeles City Division of the California Legislative Conference, which was close to the Communist Party-led Los Angeles Industrial Union Council (CIO Council), and to comrades in Hollywood and various minority communities, expressed their frustration with their one-line hero. The person best situated to challenge Councilman Christensen was CSO president Edward R. Roybal. At 31, he seemed older and more established than most other World War II veterans. Roybal was born in Albuquerque to a family that traced its roots back some 400 years to the founding of Santa Fe. His parents had came to Boyle Heights in 1922 to start a new life following a railroad strike that left Roybal?s father unemployed. Roybal graduated from Roosevelt High School, joined the New Deal's Civilian Conservation Corps, and attended the University of California at Los Angeles. He worked for the Los Angeles County Tuberculosis and Health Association and targeted the epidemic level of TB prevalent among Mexican Americans. Roybal, his wife, and two children lived in "the flats" on the southern edge of Boyle Heights. More important than Roybal's personal story was the movement he now headed. Over the course of 18-months, CSO had created the first broad-based organization within the Mexican-American community. CSO was near the center of the liberal-left ideological spectrum in the district, and had established ties to organized labor, the Catholic Church, the Jewish community, and to individuals in both the Democratic and Progressive parties. CSO benefited enormously from the steady hand, adroit skills, and tireless efforts of Fred Ross, who was proving to be one of the best organizers of his generation. Ross grew up in Los Angeles where he served as a Junior Minister in his Methodist Church. After graduating from the University of Southern California, he had managed a camp for dustbowl migrants outside of Bakersfield, and later worked with Japanese Americans as part of the War Relocation Authority. Ross then went to work out of the Los Angeles office of the American Council for Race Relations, which was formed to ameliorate racial tensions following the Zoot Suit riots. There he began to organize Latinos into Unity Leagues in a number of rural areas, before Saul Alinsky, head of the Chicago-based Industrial Areas Foundation, hired him away to help the upstart CSO. Thanks in large measure to Ross, CSO and Roybal had deftly navigated the divisive 1948 elections. While Roybal and other members of the leadership made "personal" endorsements, CSO stayed above the partisan wrangling by focusing on two highly effective get-out-the-vote drives. In the process, CSO activists developed valuable campaign skills and inculcated the newly registered Mexican Americans with the value and habit of voting. Roybal maintained his base with the steel and garment unions and the Catholic Church, as well as selectively worked with the leftist CIO Council and the third party. CSO used the final months of the 1948 presidential campaign to enhance its financial stability and establish new alliances. The affiliation with Saul Alinsky provided an enormous asset because CSO had begun its second year in existence without funds. The money for Ross? first year salary and that of CSO secretary Carmen Medina were already depleted. True to form, Alinsky pushed this negative into a positive. He used one of his periodic trips to Los Angeles to approach the self-made businessmen and Hollywood stars who shared his progressive politics and Jewish heritage. This group socialized at the Hillcrest Country Club near Beverly Hills. Alinsky?s initial contact in the group was Harry Braverman who had served on the Grand Jury that investigated the wartime treatment of Latino youth. Braverman sent Alinsky to Seniel Ostrow. Ostrow, the son of a garment worker, owned the Sealy Mattress franchise in California, Nevada, and Arizona, and served as a generous patron of liberal and left causes. About the same time, CSO reached out to the Jewish Community Relations Committee, whose executive director, Fred Herzberg, sat on the CSO Mexican-American Project Advisory Committee, and on which International Ladies Garment Workers Union allies held key posts. "The Community Service Organization could help by modifying the more aggressive attitudes of some minorities and by securing the majority?s respect for them," according to the meeting minutes. Developing a working relationship with the Mexican American community would reduce "the implicit danger of nationalism" and help insurance against the targeting of Jews during the next "economic crisis." Roybal officially made the transition from CSO president to candidate for the 9th district city council seat. He made the announcement at a CSO meeting in late January 1949 attended by 300 members. The change in officers and Roybal/s announcement received some coverage in the local press. "Mr. Nava replaces former chairman, Mr. Edward R. Roybal, who in declining renomination, announced his candidacy for the 9th ouncilmanic District, which prohibited him from accepting office in this non-political, civic improvement organization," wrote the Belvedere Citizen. Despite the good press, the political reality was that Roybal's strength was illusory. The campaign enjoyed strong leadership and institutional relationships with key sectors of the community. Latino steelworker Balt Yanez was named campaign chair, further integrating the union into the campaign, and emblematic of the nexus of two important constituency groups. Two Anglo Americans played pivotal behind the scenes roles. Former reporter and veteran political operative Roger Johnson agreed again to serve as campaign manager, and to oversee such fundamentals as organization, endorsements, fundraising, and press. Fred Ross took the lead in running a voter registration drive and setting up the structure necessary to ensure a nearly complete turnout by CSO registered voters, whose names he kept on 3 x 5 inch cards in a shoe box. Roybal met with groups, walked precincts, and raised money. His daughter Lucille, then seven, recalls that much of the campaign, including mailing parties, seemed to run out of the Roybal home. In 1983, Fred Ross, Sr. joined his son, Fred Ross, Jr., and trained organizers to defeat the unfair Recall election of San Francisco Mayor Dianne Feinstein who had been targeted because of her support for tough gun control regulation in the aftermath of the assassination of Mayor George Moscone and Harvey Milk. Fred Ross Sr.’s house meeting method was instrumental in recruiting the hundreds of volunteers who turned out to defeat the Recall by an 80% margin. Fred Ross conceived the voter outreach strategy that not only elected Ed Roybal as Los Angeles’ first Latino Councilmember in 1949, but also laid the groundwork for the Obama campaign’s Latino voter outreach campaign in 2008. Ross trained UFW organizers Marshall Ganz, Miguel Contreras and Eliseo Medina in voter outreach strategies to reach “occasional” voting Latinos, and these three took what they learned to California politics. Ganz and Medina then brought this voter outreach model to the Obama campaign. This page was last modified on 5 December 2018, at 16:26.